August 29, 2018 August 29, 2018 by KristinLeave a Comment on BAD TIMES AT THE EL ROYALE | New Trailer + Official Poster Released! 20th Century FOX has released a new trailer and the official poster for BAD TIMES AT THE EL ROYALE – Directed by Drew Goddard. The film’s all-star cast includes Jeff Bridges, Cynthia Erivo, Dakota Johnson, Jon Hamm, Cailee Spaeny, Lewis Pullman, Nick Offerman and Chris Hemsworth. SYNOPSIS: The story of seven strangers, each with a secret to bury, meet at Lake Tahoe’s El Royale, a rundown hotel with a dark past. Over the course of one fateful night, everyone will have a last shot at redemption… before everything goes to hell. In contrast to the track’s title, Boston-based alt pop/rock trio shallow pools stay high above water with their new single “Sinking,” out NOW. The follow up to their debut single “It’s A You Thing.”, which was released earlier this summer, “Sinking” focus on the daily struggles that come with general anxiety. Their sound continues to expand on influences of both pop rock and alternative, while maintaining meaningful (and painstakingly relatable) lyrics. shallow pools has kept busy as of lately – the trio has played a slew of shows with national touring acts, such as Smartpunk Records’ RIVALS, around the state of Massachusetts, premiering their upcoming Fall EP tracks to new audiences. With a combination of rhythmic guitar, catchy melodies, and expressive lyrics, shallow pools offers a unique sound that bridges the gap between alternative and pop rock. They use music as a form of therapy, and lyrically draw inspiration from their own hardships ranging from loss, to strained relationships, to depression and anxiety. The group wants to establish a welcoming environment for people of all ages, sexualities, and gender identities. They understand the importance of LGBTQIA+ and female representation and hope that embracing their own identities will inspire others to do the same. After solidifying a new name and musical direction, the trio recorded with Chris Curran at Reclaim Music Studios in Thompson, CT. shallow pools released their debut single “It’s A You Thing.” in mid-July. Shortly after the release of “It’s A You Thing.,” shallow pools will be opening for national touring acts such as VISTA and Walkney. “Sinking” is out NOW. August 24, 2018 August 24, 2018 by thisfunktionalartfreakLeave a Comment on @Thisfunktional talks with Becky G, Alex Neustaedter A.X.L. Becky G and Neustaedter talk about having fun while on the set and there possibly being some kind of artificial intelligence like A.X.L. as soon as 5 years from now. Becky G talked about growing up dirt bike and ATV riding, while Neustaedter found an appreciation for motocross because of this role. 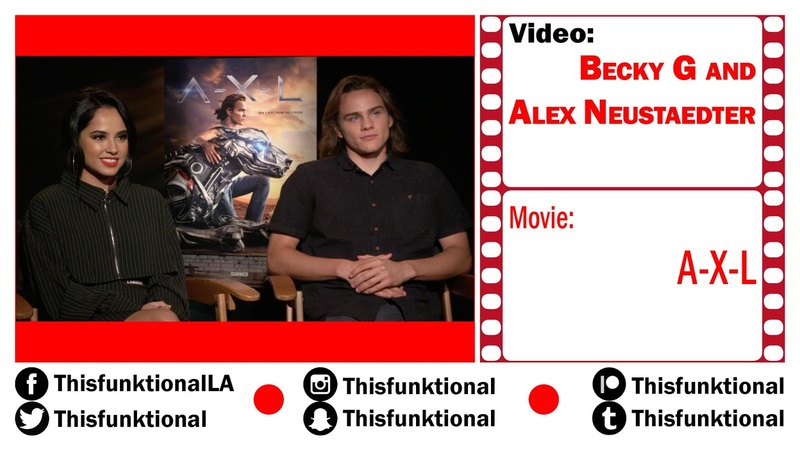 In the vein of classic ’80s family movies “SHORT CIRCUIT” and “FLIGHT OF THE NAVIGATOR,” “A.X.L.” is a new adventure about a down-on-his luck teenage bike rider, Miles (Alex Neustaedter), who stumbles upon an advanced, robotic, military dog named A.X.L. Endowed with next-generation artificial intelligence but with the heart of a dog, A.X.L. forms an emotional bond with Miles, much to the chagrin of the rogue military scientists who created A.X.L. and would do anything to retrieve him. Knowing what is at stake if A.X.L. gets captured, Miles teams up with his smart, resourceful crush, Sara (BeckyG), to protect his new best friend on a timeless, epic adventure for the whole family. Inspired by Universal’s original cinematic Monsters and the studio that invented the horror film, Universal Studios Hollywood unearths an all-new “Halloween Horror Nights” maze based on the original “Universal Monsters”…with a terrifying contemporary twist on these classic horror icons.The new maze will also feature an original score produced and composed by celebrated GRAMMY® Award-winning musician SLASH, long hailed as one of the 10 best electric guitar-players of all time. “Halloween Horror Nights” begins on September 14. “Halloween Horror Nights” continues to pay homage to these creatures of the night in this new maze by reawakening more than a dozen of these iconic classic Monsters. The essence of the maze will underscore each of their unique attributes and reimagine them into terrifying modern day characters. 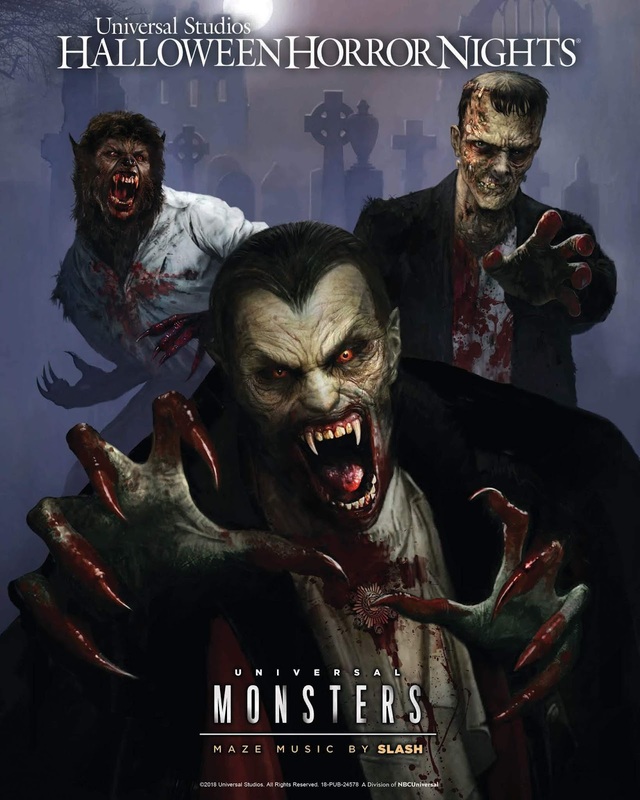 At a glance, resurrected monsters will include The Wolf Man, The Invisible Man, The Phantom of the Opera, Dracula, Dracula’s Bride, Frankenstein’s Monster, The Bride of Frankenstein and The Mummy, to name a few.By giving each character a unique, complex composition, SLASH’s original score will add a haunting dimension to the experience and help define each of the characters. “This maze is the ultimate melding of two of history’s greatest icons – classic monsters and the top guitar player of all time,” John Murdy, Creative Director at Universal Studios Hollywood and Executive Producer of “Halloween Horror Nights,” said. “SLASH’s intuitive understanding of the characters’ struggles brings enormous depth to the maze to epitomize a living-movie experience for our guests. Good Pop and Sony/ATV will release the original motion picture soundtrack for SIERRA BURGESS IS A LOSER on September 7, 2018. The soundtrack was scored by Leland (Troye Sivan, Ariana Grande, Selena Gomez) and Bram Inscore (Troye Sivan). The soundtrack includes 9 original songs by the duo and will be the first release on Leland’s own label ‘Good Pop’ in partnership with Sony/ATV and Black Label Media. Producers on the soundtrack include Bram Inscore and Jordan Palmer with Leland serving as Executive Producer. The film is directed by Ian Samuels and written by Lindsay Beer. Black Label Media (BLM) produced and fully financed the film with Black Label’s Molly Smith, Rachel Smith, Trent Luckinbill and Thad Luckinbill serving as producers. SIERRA BURGESS IS A LOSER stars Shannon Purser, Kristine Froseth, RJ Cyler and Noah Centineo and will be released globally on Netflix on September 7, 2018. The film is a modern retelling of the Cyrano de Bergerac story set in high school. The story centers on Sierra (Shannon Purser), an intelligent teen who does not fall into the shallow definition of high school pretty but, in a case of mistaken identity that results in unexpected romance, must team with the popular girl (Kristine Froseth) in order to win her crush (Noah Centineo). “The Other Side” performed by Betty Who will be released in advance of the film on August 31, 2018. The full soundtrack will be released on September 7, 2018 in conjunction with the film. “Sunflower,” performed by Purser, “Kid Wonder,” and “The Other Side” were co-written by Troye Sivan. The soundtrack features performances by Sabrina Carpenter, MNEK, Betty Who, Allie X, K.I.D, Carlie Hanson along with a duet between Leland and Vincint called “Middle of Love”. Vincint was recently on The Four, where he blew away judges Meghan Trainor, P Diddy and DJ Khaled with his performance of “Creep”. Leland is an award-winning artist, songwriter, producer and composer based in Los Angeles. He has written songs for Selena Gomez (“Fetish”), Troye Sivan (“Youth”), Daya (“Hide Away”, and Martin Garrix (“There For You”). McLaughlin studied at Belmont University in Nashville, TN. Bram Inscore is a multi-instrumental, composer, and producer based in Los Angeles. He spent his formative years touring and recording as a bass player and keyboardist with a wide range of artists including Beck, Twin Shadow, and Charlotte Gainsbourg. Bram has recently been writing and producing hits with artists such as Troye Sivan (platinum selling single, “Youth”), Mayer Hawthorne, Icona Pop, and Little Boots. Black Label Media (BLM) was formed in 2013 by partners Molly Smith, Trent Luckinbill and Thad Luckinbill to finance and produce bold films with commercial appeal. (directed by Philippe Falardeau, starring Reese Witherspoon), and “Rebel in the Rye” (directed by Danny Strong, starring Nicholas Hoult). BLM also acquired an interest in “Begin Again” (written/directed by John Carney, starring Kiera Knightley and Mark Ruffalo). They also co-financed and Executive Produced the Academy Award-winning “La La Land” with Lionsgate. Up next on the BLM slate is Peter Sattler’s “Love & Oatmeal” starring Ben Platt and Lola Kirke. From Ashes to New have released their new music video for ‘Broken’, the follow-up single to their hit ‘Crazy’, which recently reached #2 on the U.S. Rock Radio chart. The track conveys a message of perseverance and believing in yourself when others try to push you down and hold you back in life. It’s a recurring theme in their music which is very personal to the band. Their debut album Day One earned the band a Top 10 track at Rock Radio with the single ‘Through It All’. Following an extensive album cycle, the band’s original drummer and co-vocalist both abruptly left the band. Rather than focusing on the setbacks, From Ashes to New forged ahead with a new energy and purpose. The band, now comprised of frontman/rapper/programmer Matt Brandyberry, guitarist Lance Dowdle, vocalist Danny Case, and drummer Mat Madiro (Trivium) released their second album, The Future earlier this year, via Eleven Seven Music. The band is touring the U.S. extensively for the rest of the year, with a headline run throughout September and October and are working on plans for a European tour in early 2019. In addition to their U.S. headline tour, they will be opening for Five Finger Death Punch and Breaking Benjamin on their autumn arena tour and will also be performing at several festivals, as well as providing direct support for Stone Sour and Papa Roach on select dates. For tickets and more information, visit www.fromashestonew.com/. Forgiven Films, a division of GVN Releasing, launched the first full-length trailer and film poster for “SHINE” on August 21. The Latin dance drama stars “Dexter’s” David Zayas, “Orange Is the New Black’s” Alysia Reiner and world-renowned dancers Gilbert Saldivar as well as Jorge “Ataca” Burgos. “SHINE” won the audience award for best feature at last year’s Urbanworld Film Festival. “SHINE” is being distributed by Forgiven Films, a division of GVN Releasing. Two Puerto Rican brothers, Ralphi Matas (Jorge Burgos) and Junior (Gilbert Saldivar), from New York’s Spanish Harlem and the street’s best Salsa dancers, are separated after a tragedy only to reunite years later on opposing sides of gentrification. The 2018 MTV Video Music Awards aired on MTV August 20th at 8/7c. From Radio City Music Hall in NYC, there were so many great performances that I thought I’d share some of my favorites. What were your favorite moments? Let me know! 4TH AVE, everyone’s favorite boys of summer, ended off the season strong with the release of the Initiation EP on Friday and attending and preforming at the VMAs yesterday. They were seen on the pink carpet with Bebe Rexha and VMA MD and EMMY NOMINATED Adam Blackstone. Fresh out of ABC’s Hit Show “Boy Band,” 4th Ave is made up of Jaden Gray(Compton), Marcus Pendleton (Nashville), Cam Jackson (New Jersey) and Mikey Jimenez (Los Angeles), who all came together after making it to the season finale of Boy Band, and decided to form their own group with the advice of iconic producer Timbaland. 4th Ave’s journey together began in January 2018, when they officially announced the group name, website, and online store. In only a few months of working together, the group has surpassed expectations by exceeding 1 Million streams on Apple Music and Spotify. They have also amassed over 20K followers on Instagram, 8.5K subscribers on YouTube, and over 3K super fans have signed up for their text messaging service. Recent performances include The Voice with Charlie Puth, this year’s NBA All-Star Celebrity Game, and The March for our Lives Concert in D.C. alongside Vic Mensa, Demi Lovato, Miley Cyrus, and many others. Country Star MORGAN EVANS Releases Self-Titled EP – Out Today! August 21, 2018 August 21, 2018 by KristinLeave a Comment on Country Star MORGAN EVANS Releases Self-Titled EP – Out Today! Rising star Morgan Evans made a stop at Tootsie’s on Nashville’s historic Broadway last night to reveal the surprise release of his self-titled EP, out now. In the spirit of the EP’s brand new, live-in-the-moment track, ‘Young Again’, Evans treated fans to an impromptu round of shots to celebrate the moment. Bringing it full circle, Tootsie’s was the Australia native’s first stop when he visited Nashville for the first time 10 years ago – dropping his bags and arriving on Broadway less than two hours after his plane landed. ‘Young Again’ has quickly become a fan-favorite at Evans’ dynamic, one-of-a-kind live show where he commands the stage solo with his signature loop pedal. A fun party anthem that throws caution to the wind, the song couples carefree sing-along lyrics with a driving beat. Produced by Chris DeStefano, the EP is a glimpse at Evans’ Warner Music Nashville / Warner Bros. Records full-length debut album, due out this autumn. The talented singer/songwriter co-penned each track on the EP and the forthcoming album. Previous single ‘Day Drunk’ kicks off the EP, followed by the stirring and anthemic ‘American’ alongside ‘I Do’, which Billboard acclaimed as a “breezy love song”. The top 5 US debut single ‘Kiss Somebody’ and the brand new track ‘Young Again’ round out the release. Morgan will very shortly take to the stage for the 12th annual ACM Honors at Nashville’s historic Ryman Auditorium and then return home to Australia for a string of SOLD-OUT headline shows. He’ll also hit the road again with Chris Young in September as a special guest on the Losing Sleep World Tour 2018. Praised by Rolling Stone as “a savvy performer with strong songwriting chops” Australian-born rising Country artist Morgan Evans is making waves with ‘Kiss Somebody’ – his debut U.S. single with Warner Music Nashville. Already a Top 5 hit at Country radio, the track has surpassed 45 million on-demand streams while skyrocketing into Spotify’s Global Viral 50 chart. Forging a path as one of the genre’s up-and-coming stars, he has been named one to watch by CMT, SiriusXM, Pandora, Rolling Stone and more. A bona fide Country force in Australia, he has garnered countless awards and honours, most recently claiming Country Work of the Year for ‘Kiss Somebody’ at the 2018 APRA Music Awards. After sharing the bill with global superstar Taylor Swift, Country hit-maker Cole Swindell and more A-list acts, Evans is featured as a special guest on Chris Young’s Losing Sleep World Tour. He recently completed his 10 IN 10 US tour, performing 10-straight shows in 10 days including SOLD-OUT headline dates in Los Angeles, Atlanta and New York. His highly anticipated debut album is in production, with additional details to be revealed soon. From Athens to London, emerging rock outfit 7he 7ouch are set to release their debut EP Seventyseven on October 29th. The new single ‘Solution’ is out now and is the first track taken from the upcoming EP. Racing with energy and unmissable hooks, the track holds a deeper message, inspired by the political turmoil affecting us across the globe and the extreme ideologies people have on how to deal with the issues. After leaving their home in the midst of the financial crisis to pursue their dreams in London, 7he 7ouch underwent months of hardship as they found their feet in the city, which has ultimately played a major role in defining their hard hitting, alternative rock sound. The band, formed of Constantine (vocals), Stelios (guitar), John (lead guitar), Anthony (bass) and Dave (drums), recorded Seventyseven between studios in Athens and London which consists of six explosive tracks, written and performed from their hearts. With each member bringing influences ranging from old school rock’n’roll through to nu metal, they’ve created a record which pays homage to the past, with huge guitar solos and memorable melodies, whilst ferociously tearing into tomorrow with attitude and force. 7he 7ouch have headlined venues across London, including Camden Assembly, Cargo and Proud and have played Camden Rocks Festival in both 2015 and 2017. Now stamping their mark as a band to watch, 7he 7ouch will be releasing music throughout 2018 with more shows soon to be announced. Canadian alt-pop quartet ROMES have released their brand new Beyonce-inspired track ‘Out Of It’, out now via Five Seven Music. This is the first taste of their upcoming second album, the follow-up to their self-titled 2017 debut. ‘Out Of It’ was produced by Tony Hoffer (Beck, Phoenix, Fitz and the Tantrums, M83) and the official music video was directed by drummer Nicolas Amadeus in Northern Ontario, Canada. “We’ve been playing ‘Out Of It’ at our shows this year and have always had people come up to us after the shows, asking what it was. Inspired by the fans passion for the song, we decided to go back into the studio with Tony and record a studio version”, frontman Jacob Alexander explains. “The writing was inspired by Beyonce. I just imagine Queen B on stage doing that leg move she does, belting out the lyrics”. ROMES is comprised of brothers Jacob Alexander (vocals) and Nicolas Amadeus (drums), Andrew Keyes (bass) and James Tebbitt (guitar). The childhood friends met while attending school in Ireland, connecting over their mutual passion for rock music and undeniable chemistry as musicians. Perfecting their inimitable sound since their adolescent years, ROMES effortlessly documents true emotion in their songs while accenting each member’s personalities to create irresistible, eclectic music. Their 2017 eponymous release, ROMES features breakout hit songs ‘Believe’ and ‘Summer Sound’ and was praised by Billboard for its “infectious groove”. SYNOPSIS: Michael Moore’s “Fahrenheit 11/9” is a provocative and comedic look at the times in which we live. It will explore the two most important questions of the Trump Era: How the f**k did we get here, and how the f**k do we get out? It’s the film to see before it’s too late. NEW SINGLE ‘HEAR ME NOW’ FT. DIAMANTE IS OUT NOW! Due to overwhelming fan demand Bad Wolves – the US rock band who emerged as the #1 breakout act globally this year – have moved forward their touring plans and announced that their first ever UK & European shows will happen this October alongside Three Days Grace. The tour includes dates all across Europe including Portsmouth, Nottingham, Birmingham, Bristol, London, Glasgow and Manchester in the UK. Tickets are on sale now and available at See Tickets. Earlier this year the band released their version of The Cranberries ‘Zombie’, which soared to success all over the world, and has been certified Gold in the United States and Australia as well as Platinum in Canada. The track has topped charts worldwide, including the U.S. iTunes overall and rock charts, Billboard’s Mainstream Rock Songs chart, Spotify’s Global Viral 50, both the UK Rock Chart and Metal Chart, and the Shazam charts while also reigning atop the Canadian and American Rock radio charts for eight and three straight weeks, respectively. The official music video, a tribute to the late singer Dolores O’Riordan of the Cranberries and an homage to the original, has garnered over 125 million views across platforms and in June this year, Bad Wolves presented a $250,000 check to Dolores O’Riordan’s four children, fulfilling the promise to donate all of their proceeds. The follow up single ‘Hear Me Now’ feat. Diamante is also quickly climbing up the charts. Bad Wolves are currently touring North America with heavyweights Five Finger Death Punch and Breaking Benjamin on the biggest US rock tour of summer 2018 and, as a special treat for fans, Diamante is performing “Hear Me Now” live with Bad Wolves every show. Bad Wolves’ debut album Disobey, released in the Spring via Eleven Seven Music, achieved the following chart positions in the USA: #22-Billboard Top 200, #2-Hard Rock Chart, #4- Rock chart, #8-on the Top Current Albums Chart. In the UK, the album reached #1 on the official Rock and Metal charts, as well as #1 on the iTunes Rock and Metal charts (also in Germany and France). In addition, the album reached #1 in a total of 15 countries across Europe, including Holland, Ireland, Finland, Belgium and many more. The band has amassed over 60 million track streams, 400,000+ downloads to date and, mainstream media such as BBC, The Times, The Sun and The Guardian in the UK, as well as great support from rock and metal media worldwide. Tickets available at See Tickets. ‘Take Me Out’ has featured on six Spotify ‘New Music Friday’ playlists today including the UK. It’s a huge pop banger stacked with attitude and boasting a massive chorus. In support of the album’s release the Essex-born singer has announced an HMV in-store tour where she will be signing copies of Villains and performing songs from the album live. HMV will be stocking exclusive yellow edition color vinyl of the new album and the tour will call at seven stores across the country.